Confession: I used to really like Anna Kendrick. After all, she's an extremely talented Academy Award-nominated actress. But when I started following her on Instagram and Twitter, I found that I actually love Anna Kendrick, and I want this witty, smart lady to be my new BFF. Case in point: Her Twitter tag line is "Pale, awkward and very very small. Form an orderly queue, gents. Location: Probably by the food." She talks about hating pinstriped suits ("The adult version of Ed Hardy. Letting chicks know you're a douchebag from 100 yards away, just more expensive. "), when someone actually uses a phone to call you ("I basically assume someone has died. "), and jarring alarm bell ring tones ("That damn sound makes my balls jump up into my body. Wait, what?") in a way that makes me want to go stand by the food with her and talk about how we both like to cry on cross-country flights. When I heard she was hosting a charity event for Lipstick Angels, an emerging non-profit that provides makeovers for women battling serious illnesses, I jumped at the chance to meet her. Turns out, she's just as witty (and teeny-tiny) in person as she is on Twitter. She also scored points for filling out my questionnaire even after her PR team raised their red flag when I whipped it out of my purse. Next thing you know, we'll be swapping makeup tips like BFFs. Oh wait, we already did that! Sad, wilted bouquets: When I ask her to tell me something people would be surprised to know, she bites her lip as she thinks for a moment. "The pressure!" she jokes. Looking around the room, her eye falls on a bouquet of peonies, and she says, "I hate flowers." I picture every person who has ever sent her flowers instantly regretting it after I break this news, and she seems to envision the same thing, saying, "When someone sends them to me to thank me or congratulate me, obviously it's so incredibly sweet and thoughtful. But all I can think about is, 'When are these going to die? When am I going to have to throw them out?' Note to self: Send Anna a potted plant, not the previously planned dozen roses, to thank her for our interview. Getting glammed up: "I play more with makeup now. I used to only wear, like, pink lipstick, but now I know if I try a bolder lip the world is not going to end." The beauty trend she wants to try: "Goldleaf. Obviously I would never attempt this on myself, but I would love to try it." Her biggest beauty flub: "I'm getting better at doing my makeup, but I did try those individual lashes and they're impossible, she says. One side of my lash ends up being regrettably heavy." 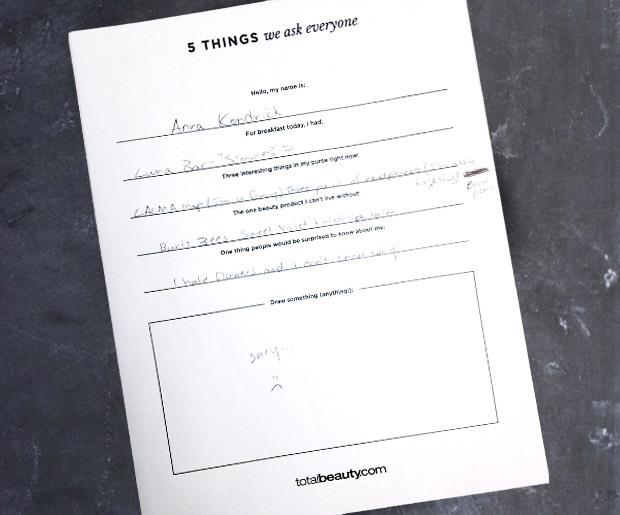 On Lipstick Angels: Hosting the charity event for the partnership between Burt's Bees and the emerging non-profit was a no-brainer for Kendrick, who is a long-time fan of the brand and believes in the healing power of looking your best. "It might seem silly, but it's a really simple and powerful thing," she says, of the makeovers that the Lipstick Angels give to women suffering from illness. "These products are all-natural and made with natural ingredients, which is important to women who are battling illnesses." The one thing she can't do: "I can't draw," she confesses to me, when I hand her the contraband questionnaire below. I tell her it's okay, since the singing, dancing, Oscar-nominated actress seems to have just a few other talents.